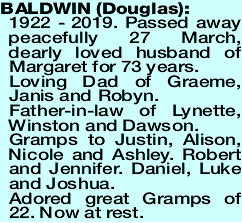 BALDWIN DOUGLAS 1922 - 2019. Passed away peacefully 27 March, dearly loved husband of Margaret for 73 years. Loving Dad of Graeme, Janis and Robyn. Father-in-law of Lynette, Winston and Dawson. Gramps to Justin, Alison, Nicole and Ashley. Robert and Jennifer. Daniel, Luke and Joshua. Adored great Gramps of 22. Now at rest. On MONDAY morning (08.04.2019) you are invited to celebrate the life of the late Mr Douglas Craig Baldwin, of Albany at a Ceremony to be conducted in Bethany, 1 Prior St, ALBANY, to commence at 11am.